Comments: Comments Off on My Favorites of the Week: The 2010 Blizzard Edition! My Favorites of the Week: The 2010 Blizzard Edition! Starting off the ‘2010 Blizzard Edition’ is a blog post from Anthony Picciano (@apicciano), in which he shares some great pics from his POV of the epic blizzard of 2010. Although I was visiting upstate, NY during the actual blizzard, I experienced the aftermath of delayed trains and saw lots of abandoned cars while utilizing ill-equipped mass transit services. 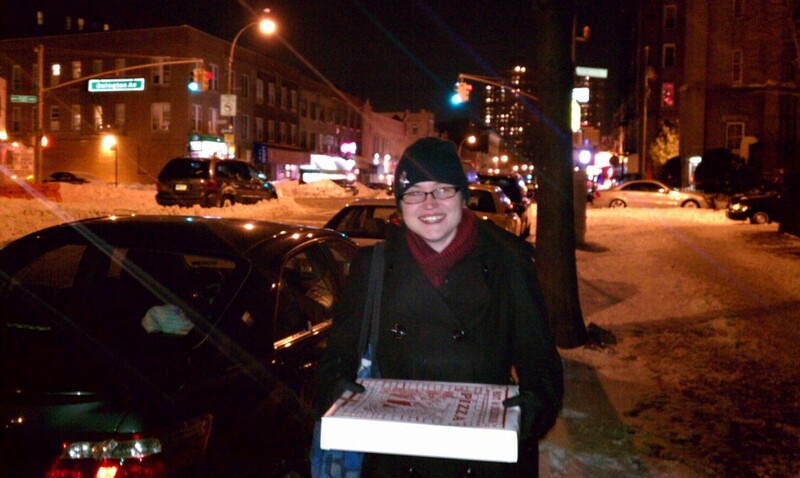 I had to walk home from the subway with bags around my ill-equipped boots, but at least I had some fully-equipped southern Brooklyn style pizza to welcome me back! I'd rather be holding this box of pizza than stuck in that stranded minivan! My next favorite is an update from Daisy Dominguez (@daisilla) where she sends Maura Smale (@msmale) a public message about incorporating the Academic Commons feed into her RockMelt Web Browser. RockMelt keeps me from having to log onto FB & Twitter multiple times since I can kind of see what’s going on with their navigation. They even have a navigation thing on the right for CUNY Academic Commons so I can see what other people are up to kinda like on FB so I like that, too. I have trouble logging onto it sometimes, though, especially from my PC at work. Thanks for posting about this time saving web 2.0 tool, Daisy. I look forward to receiving my invitation and posting about my experience as well. My next favorite this week is an update from Guila Guarnieri (@giulia), inviting members of the Commons to view materials developed for the BCC podcasting program. I’m quite impressed at the scope of this project and I’m looking forward to learning more about it this upcoming spring semester. If you get a chance, be sure to check out BCC’s podcasting resources and provide some feedback. Next up is a forum topic from the Open Access group entitled: OA presentation at the CUNY IT Conference. Maura Smale (@msmale) shares some slides and handouts from the Open Access presentations at the #CUNYIT Conference held at John Jay College on December 3, 2010. Many thanks for sharing some great OA resources, Maura! If you want to learn more about the Day 1 session, please check out @valeriefutch’s terrific blog post where she highlights different sessions throughout the day. Speaking of conferences (or rather “unconferences”), my last favorite of this week (and year) is a forum topic in the Digital Humanities Initiative group entitled: THATCamp New York. In this post, grad student Jonathan Eskew (@toomanywords) reaches out to fellow CUNYs to find out who would be interested in putting together a cross-university THATCamp in New York. From the looks of the THATCamp website, the “unconference” will take place November 11th & 12 of next year and from the looks of the forum thread, there are a lot of interested CUNYs! Well, that’s all for 2010… May you all have a wonderful New Year! As Matt Gold highlighted back in the summer of 2009, the CUNY Academic Commons rolled out an issues website where the development team could keep track of bugs and issues that are causing problems on the Commons. 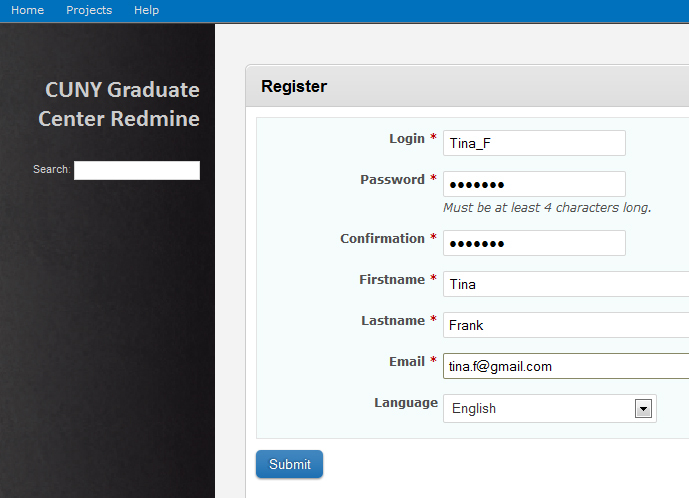 The site is an installation of Redmine, a robust open-access project management solution which allows the community and development teams to report and keep track of bugs, feature requests, and support tickets. What I really like about the site is that you only have to log in to report an issue, which means that our work on the Commons is completely transparent. Below is a snapshot of the main page where you can access the CUNY Academic Commons project: Overview, Activity; Roadmap; Issues; News; Documents; and Files. After reading @brianfoote’s summary of changes for groups associated with the upgrade to version 1.1 on the Commons, I was excited to add the external blog posts feature to one of my groups. I was not as excited to learn that everyone in my group was sent an email notification for every single blog post associated with the external blog. I quickly reported this issue to the development team and Boone @boonebgorges just as quickly disabled the notifications associated with external blogs posts. 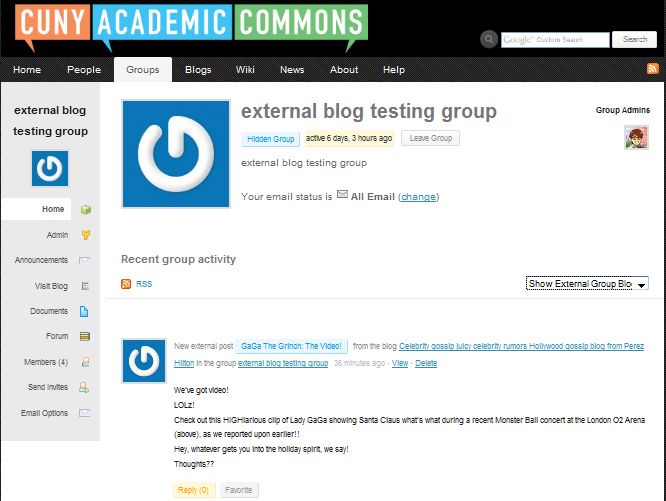 Now, members will access the external blog posts directly through the group’s activity stream. You will just need to choose a login ID and password, fill out your first and last name, and email address. Whether you report a bug through Redmine or via email, we invite you to help us make the bugs go SPLAT! Unfortunately, registration filled up pretty quick for day 2 so not as many folks were able to come as would have liked to. While I wasn’t able to do what I really wanted to do – split myself into seven Morgano’s to attend each session – I did take some notes on the sessions that I was able to attend. There were also flurries of tweets about the conference marked with the hashtag #cunyit for your viewing pleasure. Honorable Technology: Towards a Digital Honors Code, by Joe Ugoretz (@jugoretz). Helen’s presentation focused on Education faculty attitudes towards teaching online. Helen discussed the results from Sloan’s seventh annual report on the state of online learning in U.S. higher education, highlighting that while the number of programs and courses taught online continued to grow, acceptance by faculty has not changed. She also noted the difference between asynchronous courses (wholly online) and hybrid courses (blend of online & face-to-face). Helen went on to discuss the results from a survey that she conducted at the City University of New York and Indiana University. Using the Likert Scale, Survey Monkey was utilized to measure 109 Education faculty participants’ beliefs and attitudes about teaching online. While Helen will be sending the full results to interested CUNYs via email, I was able to note some general results — among which show motivators and barriers for teaching online. Faculty indicated that motivators include benefits to both their students and their institution, and the flexibility of an online course. Barriers include lack of time for course design and lack of tech support. Additional effort seemed to be the biggest deterrent among surveyed faculty. Faculty and staff in the room universally agreed that an online course is more time consuming than a face-to-face course and concerns were raised about the impact that teaching online might have on tenure. I was saddened to hear that many faculty had to downplay their technical skills while going through the tenure process because they feared it would not be viewed favorably. Helen wrapped up her session by offering some suggestions to help garner Education faculty support for online instruction. In addition to supplying robust technical support and lowering enrollment caps for online classes, Helen suggested that not teaching 100% online would be a way to break stigmas associated with online instruction. The second part of the dual presentation was by Joe Ugoretz, Associate Dean of Teaching, Learning, and Technology at Macaulay Honors College. Joe discussed recent incidents with Macaulay students involving cyber bullying and wiki vandalism which prompted the creation of a “Digital Honors Code”. After a positive response from students who were sent information about the Digital Honors Code via email, Macaulay IT Fellows engaged with students, faculty, and advisors to make amendments to the honors code, create guidelines for online behavior, and generate case studies. To make the honors code more open and community-based, the materials were put online in Fall 2010. Recognizing that there are different impulses and temptations online, Joe split the room up into teams and charged each team with reviewing a case study and offering suggestions on how to handle the situation. My team chose “The Difficult Prof” and suggested that the student reach out to the student ombudsman, their advisor, or the academic director of their program instead of tweeting about how terrible their teacher was. Someone brought up that the tweet could have also been picked up by CUNYFail, a twitter account dedicated to retweeting others tweets about “CUNY’s failures”. Incidentally, one of my earlier tweets from the session was retweeted by CUNYFail – doheth! Joe ended his session by asking everyone in the room how they would get students to participate in the Digital Honor Code site and one of my favorite suggestions was to ask students to develop a collaborative honors code contract. What I loved about these presentations was that both Helen and Joe really engaged everyone through discussions and activities. Most definitely not a CUNYFail! 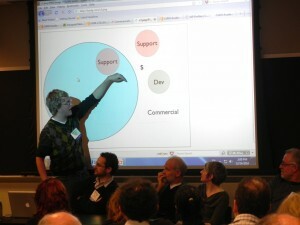 Boone B. Gorges discusses key distinctions of open source during the “Building Communities on the CUNY Academic Commons” session. Following that energizing session I hung out with fellow Community Facilitators Brian Foote (@brianfoote) and Scott Voth (@scottvoth) at the CUNY Academic Commons sign-up tables, where we engaged in a lively discussion about ways to enhance the overall experience for members on the Commons (i.e. – highlighting our new Codex/Community Portal blog on the homepage). On that note — If you have suggestions about features you would like to see on the Commons or want to learn more about an existing feature, please don’t hesitate to contact the Community Team. 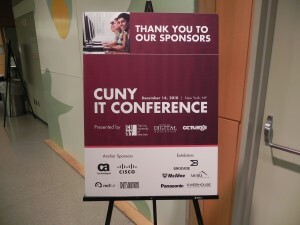 Overall, I have a terrific experience with day 2 and I’m already looking forward to the 10th Annual CUNY IT Conference! Did you attend day 2?? Share your experience below by leaving a comment or better yet – write about it on your blog! 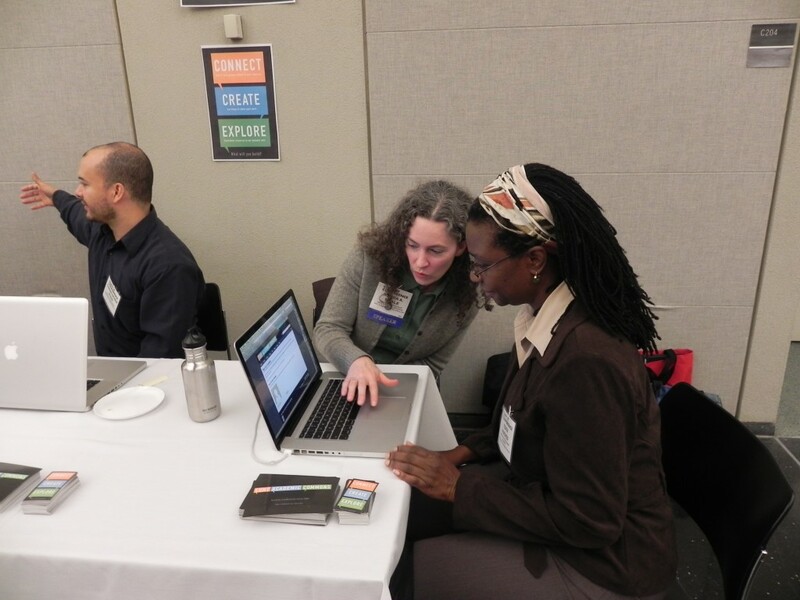 Maura A. Smale (@msmale) helps a fellow CUNY sign up for the Commons. Jane Cramer GovDocs I love and I hope you will too. Welcome to Commons Connect. I'm Sarah, one of the community facilitators on the CUNY Academic Commons. I tweet for the @cunycommons Twitter account and use this blog to share information and resources with the Commons community. © 2009 Commons Connect. All Rights Reserved. This blog is powered by Wordpress and a basic Wordpress Magazine Theme.